Ayaan Hirsi Ali, the incredibly courageous, Somali-born author, has written a new book, Heretic, in which she calls for "nothing less than a Muslim Reformation." Hirsi Ali identifies her audience as "Mecca Muslims", her label for non-radical, religious Muslims, a category few Muslims will understand unless they read her book. She writes: "I hope to engage (Mecca Muslims) ... in a dialogue about the meaning and practice of their faith. I hope that they will be one of the primary audiences for this book." No Muslim will pay heed to someone who has referred to the Prophet Mohammed as a "pervert" and a "tyrant." Unfortunately, that is unlikely to happen. I say this because no Muslim will pay heed to someone who has referred in the past to the Prophet Mohammed as a "pervert" and a "tyrant." 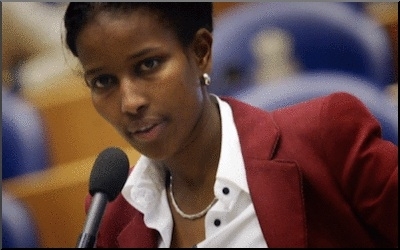 But Hirsi Ali today identifies more with the American literati than with the secular dissidents dying in Bangladesh or Pakistan, jailed in Turkey and Iran, or the persecuted Rohingya Muslims adrift in the Bay of Bengal. "I am now one of you: a Westerner. I share with you the pleasures of the seminar rooms and the campus cafes. I know we Western intellectuals cannot lead a Muslim Reformation. But we do have an important role to play." As for a "reformation" in Islam, if religions could be reformed through reason and logic, then the biblical belief that God appeared in the form of a burning bush on Mt. Sinai to talk to Moses would at best be considered a fairy tale, not a fact. Similarly, the story in the Bible and Qur'an of God asking Abraham to slaughter his own son (Jews say this was Isaac while Muslims insist it was Ishmael) as an act of sacrifice can only be believed if one has blind faith in one's religion, not because of any rational thought process. Hirsi Ali misses this point completely in her latest book. She is right in her call for Muslims to abandon sharia, but guilty of invoking that very sharia to pass judgment on Prophet Mohammed as a pervert and tyrant.